Far Cry New Dawn Alcatraz Island Expedition Details | Nerd Much? Far Cry New Dawn is nearly upon us folks. And if you’re one of the many ready to return to your familiar stomping grounds of Hope County, but with a post-apocalyptic twist, Ubisoft has another treat for you. The team has given us Far Cry New Dawn Alcatraz Island details, breaking down the expedition set with the historical site. Within Far Cry New Dawn’s early missions, you’ll encounter a helicopter pilot from Quebec by the name of Roger Cadoret. Cadoret will welcome you aboard his ‘copter which he lovingly refers to as The Big Potato. And with The Big Potato you can adventure out to numerous closed-world expeditions. With the highly today being the Far Cry New Dawn Alcatraz Island expedition. Zhi Hong also teased that “Due to the earthquakes after the nuclear attacks, the island was shattered into several pieces.” This provides additional stealth options for the player as they attempt to take down the area’s Highwaymen. 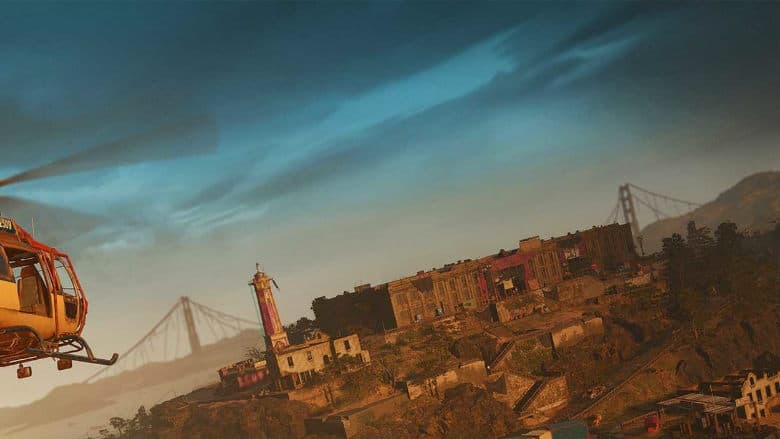 Far Cry New Dawn Alcatraz Island is just one of several expedition sites that will be available via helicopter within the game. The publisher previously teased other locations, with “a derelict amusement park, a crashed satellite, an old aircraft carrier, or a dual bridge over a canyon” confirmed by Decant. You’ll get to experience them all yourself when Far Cry New Dawn launches on February 15th. Want to know what other games are on the way in February? Check out our mega list of 2019 video game release dates.